Reg Grundy Productions. 1973. Producer: Tony Culliton. Musical Director: Jack Grimsley. LP (OP)	RG. TOW 1001. 1973. 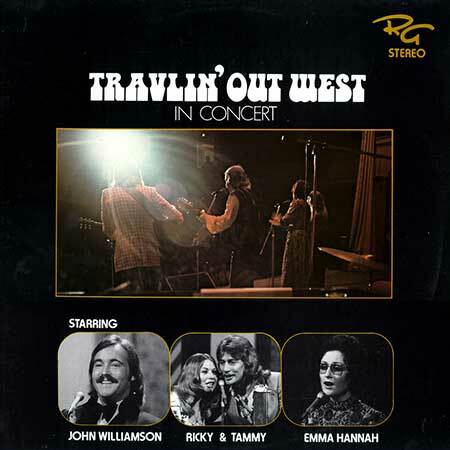 “TRAVLIN’ OUT WEST IN CONCERT”. Musical Director: Jack Grimsley. Consultant Engineer: Weston Baker. Stereo Mix by EMI Sydney. Compere: Mal Malcolm. Band: The United Sounds featuring Ken Kitching on Pedal Steel. Recorded live at Newcastle Civic Hall by Jands Electronics. v: John Williamson, Ricky & Tammy, Emma Hannah. Love’s Gonna Live Here. (Ownes). v: Ricky & Tammy. (Belinda). See The World Through Children’s Eyes. (R. Osypenko). v: Ricky & Tammy. First Time Ever I Saw Your Face. (McColl). v: Ricky & Tammy). (Essex). (Kaye - Hill - Lee). v: Ricky & Tammy. (Leeds). (Lawson). v: Emma Hannah. (Albert). v: Emma Hannah. (United Artists). Looking Out My Back Door. (Fogerty). v: John Williamson. (Palace). (Niel). v: John Williamson. (B&H). (J. Williamson). v: John Williamson. v: John Williamson. (Screen Gems, Columbia). LP (OP)	RG. TOW-1002. 1974. Gatefold. 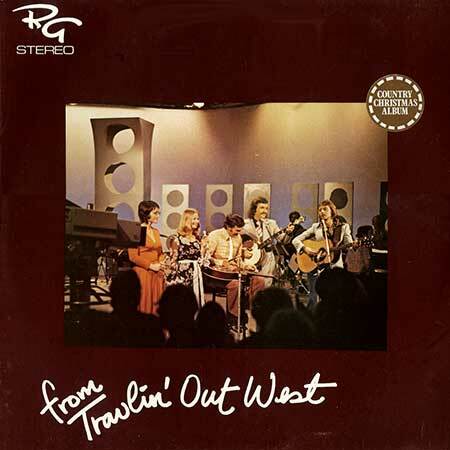 “FROM TRAVLIN’ OUT WEST”. Musical Director Jack Grimsley. Recorded by Phil Morley at Eric Porter Productions. Pedal Steel Guitar & Dobro: Kenny Kitching. Keyboards: Milton Saunders & Jack Grimsley. Lead & Accoustic Guitar: Ned Sutherland. Bass: John Bartlett. Drums: Barry Stewart. And the Guitars of John Williamson & Ricky Osypenko. v: John backed by Emma & Tammy. (Emusic). Away In A Manger. (2:41). (Trad. Arr: Grimsley). v: Emma. Church In The Wildwood. (2:36). (Trad. Arr: Osypenko). v: Ricky & Tammy. (K. Kristoffersen). v: John backed by Emma. What A Friend We Have In Jesus. (2:37). Peace In The Valley. (3:38). (J. Williamson). v: John. (Emusic). (Yarrow - Lipton). v: Ricky & Tammy. (Allan). (Tom T. Hall). v: The Gang. (C/Control).